Participating teens showcase their work, sharing a richer understanding of what it means to be Native in California and in America. “Come little Indian, dance with me.” It’s one of the superficial songs taught to young students in California. And it’s one of the many ways Native American history is romanticized, setting Native children up for a lifetime of challenges as they navigate the truth about who they are and who they come from. 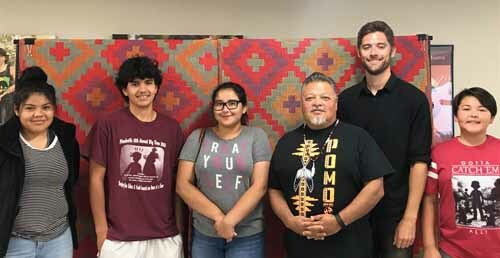 With support from First Nations’ Native Youth and Culture Fund, the California Indian Museum and Cultural Center is seeking to change this tune, helping reform California Native American Education and bringing new confidence to Native students. It’s been a problem hundreds of years in the making, according to Nicole Myers-Lim, California Indian Museum Executive Director (Pomo). In fourth grade classes in California, children are taught about the California Missions, pioneers and the Gold Rush. They are taught about miners and western expansion. But what’s missing from the lessons are the thousands of Indians who perished from disease brought by European settlers, the Native boys who were sold as slaves, and the Native women who were trafficked for prostitution. Swept under the carpet is the fact that Indians were not “asked” to join the Missions. Instead, they were forced, says Myers-Lim. Myers-Lim explains that Native students have to endure a “fantasy” that’s reaffirmed with every school year. Expecting nine-year-olds to call out the inaccuracies puts them “on the spot.” At best, it singles them out, and at worst, it makes them have to act as experts on something they likely do not understand themselves. “It’s a very strenuous climate,” says Myers-Lim. The system lets children down, she says, and this contributes to the poor academic outcomes that are common among Native youth in California and across the country. On the bright side, there have been efforts by Native communities and California Indian professors to change the curriculum used by the state of California. But Myers-Lim realizes that the wheels of change move slowly. Meanwhile, she says, we have to give kids the tools they need right now. At the California Indian Museum, those tools have consisted of a first-class museum facility, as well as language apps, dictionaries, audio visual materials, hands-on kits, and traveling kiosks. 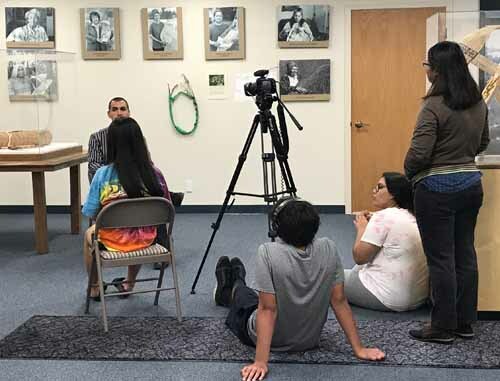 Now, with grant funding from First Nations, another resource is being developed: A series of films written and produced by Native youth in the community. By creating the seven films, teens learned about media production and also became spokespeople for Native education and the Seven Essential Understandings about California Indians. Having the teens create the videos accomplishes two things: It requires youth to research, interview, and learn directly from elders and community members, and it provides a resource that can be accessed online, viewed at the museum, and passed down and shared to educate even more kids. The seven films in the series each illustrate one of the Seven Essential Understandings, a curriculum adapted from Montana Tribes. The California Indian Museum saw the success Montana had in breaking down complex information in a way that is comprehensive but digestible. In California, they altered the understandings to fit their own circumstances and began building a curriculum that people could understand and that teachers were open to teaching. There is diversity among tribes. This means there is diversity in landscapes, people, and beliefs. “You don’t have to live in a teepee to be an Indian,” Myers-Lim explains. There is diversity among individual Indians. Each person’s identity is being developed, and Indians come in all forms, each one no more or less than another. It is not for someone else to determine, and it is not for teachers to promote stereotypes. Native ideologies and beliefs of Indians pre-date America. Indians have ancestral territories that should be respected. Reservation lands were not “given” to Native Americans. They are a result of treaties, statutes, and executive orders, which have been violated through the years. At one time, there were 18 treaties in place in California, designating 7.5 million acres to California Indians. When gold was discovered and land was taken by homesteaders, that number dwindled to less than 500,000. There have been a succession of federal policies and laws governing Indian relations and Indian rights. From Manifest Destiny to the Self-Determination Act, these policies have mandated different things at different times, having a direct effect on generations of Native Americans. History is recounted from the perspective of the person recounting it, and American history is taught based on the experience of settlers. Only by including the voice of Indians can we portray a more accurate story. Indian tribes have sovereign powers. While that makes tribes independent, sovereignty can mean different things for every tribe. In Indian Country, these understandings may be familiar, but for many non-Natives they are new concepts. By producing and sharing these films, the California Indian Museum can promote greater awareness of these Native truths. Myers-Lim hopes the video project will lead to the production of more resources and tools, and keep the momentum of education reform going, effecting change both in the classroom and at the policy level. Since the completion of the films, the students have showcased their work at screenings and events. They’ve responded to questions from audiences and have become spokespeople for cultural values and the diversity of belief systems throughout California tribes. They also took their work to the Alexander Valley Film Festival where they received honorable mention and a cash prize in the youth film competition. The project unites tribal elders, advocates, historians and educators in sharing their stories at the museum and at offsite locations. 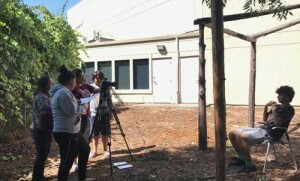 The students have also expressed interest in making more films on topics such as Native foods, environmental stewardship and cultural appropriation. Myers-Lim thanks First Nations for the funding to make projects like this happen, as well as its overall support of the California Indian Museum’s efforts to create long-term change. “It’s scary when you do something and then it can’t continue,” she says. But thanks to First Nations the organization has been able to sustain programs for story-telling, business, technology, and education. “First Nations supports capacity building, and they understand the needs and goals of tribal communities,” she says. To learn more about the California Indian Museum and Cultural Center, visit https://cimcc.org/. Each of the films on the Seven Essential Understandings can be accessed here.